Muhuo Liu, Yuan Yuan, Lihua You d, Zhibing Chen, Which cospectral graphs have same degree sequences, Discrete Mathematics 341 (2018) 2969–2976, https://doi.org/10.1016/j.disc.2018.07.017. SCI. Lihua You,Yafei Chen, Pingzhi Yuan, Some Properties of the Strong Primitivity of Nonnegative Tensors, Journal of Applied Mathematics, vol. 2018, Article ID 5241490, 9 pages, 2018. https://doi.org/10.1155/2018/5241490/. SCI. Lihua You,Yafei Chen, Pingzhi Yuan, Jieqin Shen, A characterization of a class of arithmetic functions, Chinese Journal Of Engineering Mathematics, 35(3), 2018, 340-354. Lihua You, Fang Chen, Jian Shen, Bo Zhou, Generalized Competition Index of Primitive Digraphs, Acta Mathematicae Applicatae Sinica, English Series, 2017,33(2): 475-484. SCI. Lihua You, Liyong Ren, Guanglong Yu, Distance and distance signless Laplacian spread of connected graphs, Discrete Applied Mathematics, 223 (2017) 140–147. SCI. Jinxi Li, Lihua You*, The (distance) signless Laplacian spectral radii of digraphs with given dichromatic number, Ars Combinatoria, 2017.4. SCI. Danping Huang, Lihua You*, Bounds on the spectral radius of a nonnegative matrix and its applications, Journal of Applied Mathematics, 2016. 11.SCI. Jiayu Shao, Lihua You*, On some properties of threedifferent types of triangular blocked tensors, Linear Algebra and its Applications, 511:110-140, 2016.12.15. SCI. Jinxi Li, Man Yang, Lihua You*, The minimal distance signless Laplacian spectral radii of connected graphs with given clique number, Journal of South China Normal University (in Chinese), 2016.12. Lihua You, Yujie Shu, Xiaodong Zhang*, A Sharp upper bound for the spectral radius of a nonnegative matrix and applicatio--ns, Czechoslovak Mathematical Journal, 66 (141) (2016), 701–715, 2016.10.1. SCI. Yun Shen, Lihua You*, Minjie Zhang, Shuchao Li, On a conjecture for the signless Laplacian spectral radius of cacti with given matching number, Linear and MultilinearAlgebra, Published online: 02 Jun 2016. 纸质版：2017，VOL.65,NO.3,457–474. http://dx.doi.org/10.1080/03081087.2016.118949, SCI. Lihua You, Yujie Shu, Pingzhi Yuan*, Sharp upper and lowerbounds for the spectral radius of a nonnegative irreducible matrix and its applications, Linear and MultilinearAlgebra, Published online: 08 Apr 2016. 纸质版；2017，VOL.65, NO.1， 113-128. SCI. Yingxue Zhu, Lihua You*, Jieshan Yang, The Minimal Total Irregularity of Some Classes of Graphs, Filomat, 30(5): 1203–1211, 2016.6. Pingzhi Yuan, Zilong He, Lihua You*, Further results and some open problems on the primitive degree of nonnegative tensors, Linear Algebra and its Applications, 480:72-92, 2015.9.1. SCI. Zhilong He, Pingzhi Yuan*, Lihua You, On the exponent set of nonnegative primitive tensors, Linear Algebra and its Applications, 465:376-390, 2015.1.15. SCI. Pingzhi Yuan*, Lihua You, Some remarks on P, P_0, B and B_0 tensors, Linear Algebra and its Applications, 459:511-521, 2014.10.15. SCI. Pingzhi Yuan, Lihua You*, On the similarity of Tensors, Linear Algebra and its Applications, 458:534-541, 2014.10.1. SCI. Lihua You*, Jieshan Yang, Notes on the sum of powers of the signless Laplacian eigenvalues of graphs, Ars Combinatoria, 117:85-94, 2014.10. SCI. 457: 93-113, 15 September, 2014. SCI. Wenxi Hong, Lihua You*, Further results on the spectral radius of matrices and graphs, Applied Mathematics and Computation, 239: 326-332, July, 2014. SCI. Wenxi Hong, Lihua You*, On the eigenvalues of firefly graphs, Transactions on Combinatorics, 3(3), 1-9, 2014. Pingzhi Yuan*, Zilong He, Lihua You, A conjecture on the primitive degree of tensors, Linear Algebra and its Applications, 450: 175-185, 1. June. 2014. SCI. Lihua You*, Jieshan Yang, Zhifu You, The maximal total irregularity of unicyclic graphs, Ars Combinatoria, 114:153-160, 2014.4. SCI. Lihua You*, Jieshan Yang, Yingxue Zhu, Zhifu You, The maximal total irregularity of bicycle graphs, Journal of Applied Mathematics, 2014, Article ID 785084. 2014.4.10. SCI. Jieshan Yang, Lihua You*, On a conjecture for the signless Laplacian eigenvalues, Linear Algebra and its Applications, 446: 115-132, 1. April. 2014. SCI. Liu Yu, Lihua You*, Further results on the nullity of signed graphs. Journal of Applied Mathematics, 2014, Article ID 483735. 2014.2.18. SCI. with Applications, 34(1): 12-32, 2014. Jieshan Yang, Lihua You*, I.Gutman, Bound on the distance Laplacian energy of graphs, Kragujevac Journal of Mathematics, 37(2): 245-255. 2013. Lihua You*, Han Han,The maximum Sum-Balaban index of trees with given diameter, Ars Combinatoria. 112: 115-128. 2013. SCI. Lihua You*, Fang Chen, The Scrambling index of Primitive Digraph, Journal of South China Normal University (in Chinese), 45(5): 7-12. 2013. Lihua You*, Jian Shen, A Survey on bases of sign pattern matrices, Linear Algebra and its Applications, 439:346-357. 2013. SCI. Lihua You*, Shuyong Yi, The Characterization of Primitive Symmetric Signed Digraphs with the Second Maximum Base. Journal of Mathematical Research with Applications. 33(4): 379-391. 2013. Journal of Mathematical Research with Applications,33(3): 273-287. 2013. (in Chinese), 36(3): 234-237. 2012. Shuyong Yi, Lihua You*, The bases and base set of primitive symmetric loopfree signed digraphs, Journal of Mathematical Research with Applica-tion, 32(3): 313–326. 2012. Lihua You*, Zhuru Yun, Zhifu You, The (weighted) vertex PI index of unicyclic graphs, MATCH Commun. Math. Comput. Chem, in press, 67: 383-404. 2012. SCI. and its Applications, 434:1215-1227. 2011. SCI. Longqin Wang,Lihua You*, Hongping Ma, Primitive non-powerful sign pattern matrices with base 2, Linear and Multilinear Algebra, 59(6): 693-700. 2011. SCI. (in Chinese), 29(3): 18-22. 2011. Yuhan Wu, Lihua You*, Index of an importsnt Class of Primitive (Signed) Digraphs, Journal of South China Normal University (in Chinese), 43(3): 44-48. 2011. University (in Chinese), 43: 39-42. 2011. Linyan Xing, Lihua You*, Some New Identities between Partitions and Compositions, Journal of South China Normal University (in Chinese), 41(1): 20-23. 2010. Normal University (in Chinese), 40(3): 28-32. 2009. Lihua You*, Chaohua Liang, Xiaoyan Jiang, A counting formula for the partitions of n into exactly 6 parts, Journal of Sichuan University(in Chinese), 46(4): 901-906. 2009. Linyan Xing, Lihua You*, A counting formula for the partitions of n into exactly 7 parts, Journal of Guangxi Teachers Education University(in Chinese), 26(1): 51-57. 2009. Lirong Lin, Lihua You*,The exponent of Factor 11 in the Standard Factorization of Fibonacci Number, Journal of Gansu Lianhe University(in Chinese),22(6): 4-10. 2008. Lihua You*, Yanrong Chen, A counting formula for the partitions of n into exactly 5 part, Journal of Gansu Lianhe University(in Chinese), 22(4): 7-10. 2008. Bolian Liu, Lihua You*,Gexin Yu, On extremal matrices of second largest exponent by Boolean rank, Linear Algebra and its Applications, 422: 186-197. 2007. SCI. Lihua You, Jiayu Shao*, A note on the Numbers of Nonzero entries of Maximal S2NS Matrices, Journal of Mathematical Research and Exposition(in Chinese), 27(1):113-122. 2007. Bolian Liu, Lihua You*, Bounds on the base of primitive nearly reducible sign pattern matrices, Linear Algebra and its Applications,418: 863-881. 2006. SCI. 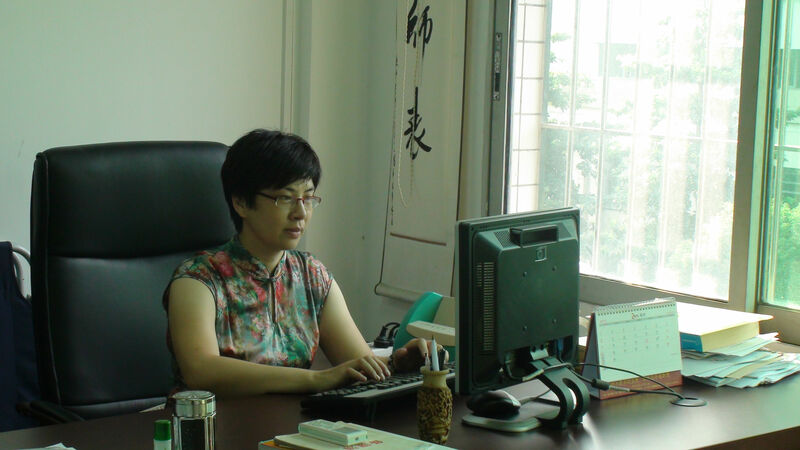 Lihua You, Jiayu Shao, Numbers of constitutes and nonzero entries of maxima l S2N S matrices, Appl. M ath. J. Chinese U iv. Ser. A (in Chinese) 20(4):424-440. 2005. Lihua You, Bolian Liu and Jian Shen, r-Indecomposable and r-nearly decomposable matrices, Linear Algebra and its Applications, 407: 105-116. 2005. SCI. J. Y. Shao, H. Y. Shan and Li-Hua You, Ray solvable linear systems and ray matrices, Linear Algebra and its Applications, 395: 229-246. 2005. SCI. Lihua You, Bounds on the basis of Primitive Nonpowerful Sign Pattern Matrices, Journal of Guangdong Polytechnic Normal University(in Chinese), 18 (6):34-38. 2003. Jiayu Shao, Lihua You, Haiying Shan, Basis of Powerful Sign Pattern Matrices, Journal of Tongji University(in Chinese), 31(12), 1490-1494. 2003. Lihua You, Bolian Liu, Bo Zhou,The index of convergence of a total digraph, Journal of Mathematical Research and Exposition(in Chinese), 23(1):163-168. 2003. Lihua You,Gexin Yu and Bolian Liu, On Maximal linear free Sets of Integers and its Spectrum,The Australasian journal of combinatorics, 23:211-215. 2001. Lihua You, (k,b)-Linear-free Sets of Integers, Journal of Guangdong Polytechnic Normal University (in Chinese), 14(4): 26-32. 2000.